Finding two-fifths of its annual end-use in autocatalysts to reduce harmful emissions from diesel engines, platinum has fallen 40% in price since news of 'test cheating' by European car manufacturers such as VW first broke in 2014. The price of palladium – nearly 80% of which goes into catalysts for gasoline engines – has meantime risen by one-third, overtaking platinum and setting new all-time record highs at the start of 2018. 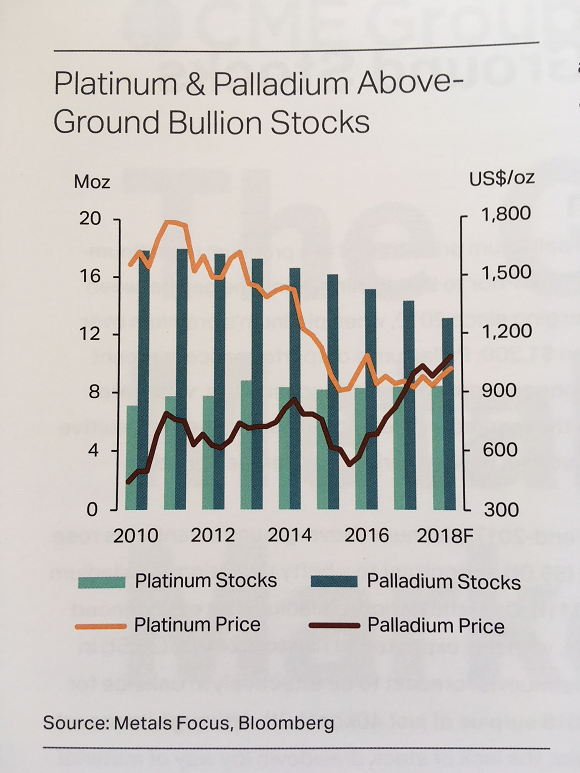 "The stark contrast between palladium's strong fundamentals and platinum's lacklustre ones continued last year and into 2018," says the new Platinum & Palladium Focus 2018 from specialist analysts Metals Focus, launched in the City of London on Monday as part of the annual Platinum Week industry meetings, seminars and events. 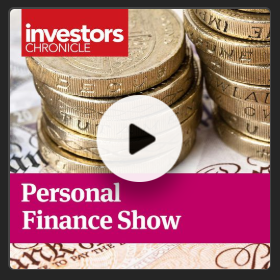 "Such a divergent trend [has] fuelled a marked contrast between investor sentiment." 2017's bull run in palladium saw wholesale dealers struggle to meet orders in what executives called a "tight market", with above-ground stockpiles set to shrink for the 7th year running in 2018 according to Metals Focus. Last year ended with 16 months' fabrication demand available in palladium, down from 25 months at the start of this decade. Platinum stocks are estimated at 13 months of demand, barely changed since 2013. Platinum mine production will fall another 1% in 2018 predicts Metals Focus, marking the third consecutive annual drop and coming 7% below the peak of 2011 at 188 tonnes. With a further 40 tonnes coming from recycling of autocatalysts, plus 17 tonnes from jewelry holdings and nearly 2 tonnes from e-scrap, Metals Focus forecast total supply 1% higher from 2017 at 247 tonnes. Jewelry, investment and industrial-use demand for platinum last year totaled 249 tonnes on the consultancy's data. "The platinum market was effectively balanced last year," says Metals Focus, with supply now forecast to outstrip demand by just 1.2 tonnes on their analysis, "broadly unchanged" from 2017's figure. But refining and technology firm Johnson Matthey forecasts a 2018 surplus almost 8 times that size as global demand for platinum autocatalysts drops 3%, with the quantity of metal used in each diesel car made by European manufacturers falling on a shift to selective catalytic reduction (SCR) technology for reducing emissions of poisonous nitrogen oxide. "Under the current direction of technological travel," said a note Friday from bullion market-makers ICBC Standard Bank, "[platinum-]bearing Lean NOx Traps look increasingly unlikely to be the solution of choice for NOx reduction. "This removes the potential for a significant demand kicker on account of increased loadings." Falling demand for diesel cars in Europe will "outweigh" 2018 growth in heavy-truck demand in the US and China, ICBC analyst Marcus Garvey went on. "But, crucially, mined supply is forecast to decline by 6%, with the potential for more significant reductions in South African production [where] more dramatic restructuring is [also] possible" from the potential sale of No.3 producer Lonmin (LON:LMI) to Sibanye-Stillwater (JSE:SGL) – approved by the Reserve Bank of South Africa on Tuesday but now being studied by the UK's Competition Commission – and a review of projects by No.2 miner Impala. "Despite great mining and processing assets," said Lonmin CEO Ben Magara at a presentation in Johannesburg on Monday, "Lonmin continues to be hamstrung by macro-economic challenges, its capital structure and liquidity constraints." Lonmin made an operating loss of $32 million for the six months ending 31 March, a drop of four-fifths from the loss made over the same period a year earlier. "At current prices we estimate about 60% of South African mines are cash flow negative," said a note from investment and bullion bank J.P.Morgan on Monday, also marking the start of Platinum Week in London. "Our mine-by-mine analysis indicates about 65% of SA and Zimbabwe mine supply will remain cash negative in 2020." 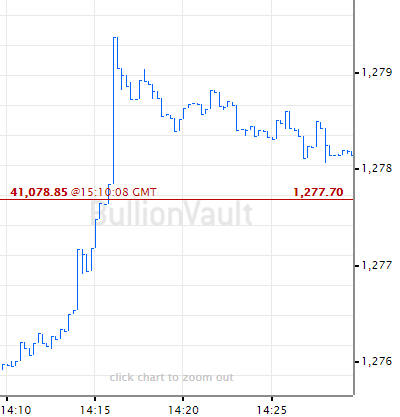 Looking at prices, Metals Focus notes platinum's "generally positive correlation with gold" – a factor also stressed Monday in a presentation from the mining-industry-backed World Platinum Investment Council. So in spite of what it calls "headwinds", Metals Focus expects platinum to average $980 per ounce in 2018, a rise of 3.3% from last year. 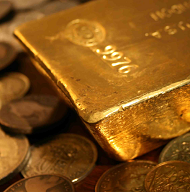 Launching WPIC's latest Platinum Quarterly report, "If gold goes up $100," said director of research Trevor Raymond on Monday's call, "platinum is likely to rise $105. 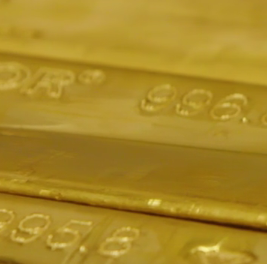 So if you're using gold to hedge [portfolio] risk, why not look at platinum instead?"